Boudin's San Francisco Sourdough Bread is entirely unique. The tangy crust and soft creamy center, carved out into food bowls and served with Boudin's famous clam chowder, is one of San Francisco's food treasures. Make sure you visit the bakery while visiting San Francisco. In 1849, a French immigrant named Isidore Boudin moved to San Francisco to capitalize on the Gold Rush boom. He used traditional European techniques to capture natural yeast found in the air for his "mother dough," or the base of the sourdough bread. Boudin discovered that the foggy climate and native yeast found in San Francisco produced delicious bread that was entirely different than the French sourdough baked in France. While other bakers began using Fleischman's cake yeast in 1868, Boudin refused to change his formula. Boudin's sourdough bread consisted of only four ingredients: unbleached flour, water, salt, and a portion of the mother dough. Boudin added no preservatives, flavorings, sugar, fats, or dough conditioners to his bread. Amazingly, Boudin's recipe for sourdough bread is still used at all of their bakeries. And, a part of Isidore's original mother dough has been used in every single loaf of bread made by the company in the last 160 years. The mother dough is fed with water and flour daily to ensure the survival of the strains of yeast Isidore originally captured. The mother dough even survived the fire and earthquake of 1906 when Louise, Isidore's wife, saved a portion of the mother dough in a bucket. The Boudin family managed the bakery until 1931, when large mechanized bakeries drove out smaller artisan bakeries like Boudin's. Master baker Steve Giraudo Sr. purchased Boudin from the Boudin family, with their approval in 1941, and continued producing Boudin's bakery using the original mother dough. Steve Giraudo passed away in 1994 and master baker Fernando Padilla continues in Boudin's bakery tradition. From a single storefront in 1849, Boudin's Bakery now has 29 locations across San Francisco and Southern California. Each bakery produces sourdough bread using a small bit of Isidore's original mother dough. The bakery is also famous for its clam chowder served in sourdough bread bowls and has a huge assortment of sandwiches and soups on offer at its bakeries and restaurants. Their flagship store is at Fisherman's Wharf which holds 26,000 feet of bakery delights. 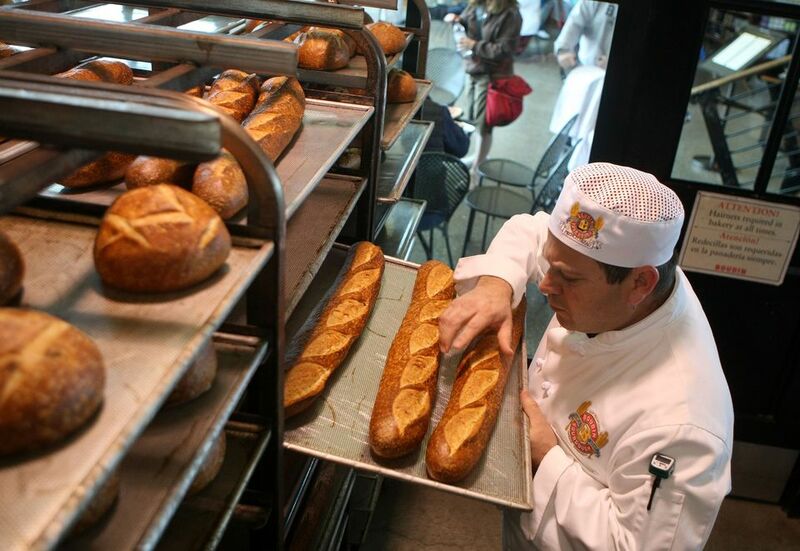 The Fisherman's Wharf locations includes a demonstration bakery; an informal Bakers Hall market and Boudin Café; Bistro Boudin, a full-service restaurant and private dining room; and the Boudin Museum & Bakery Tour. The museum and bakery tour cost $3 and are free if you dine at Boudin Bistro. The small museum and bakery tour walk the visitor through the process of making bread, including visuals and explanations that help the visitor understand why the wild yeast in San Francisco produces such unique bread. The museum and bakery tour should take around 15 minutes to visit.